While I haven’t committed 100% to another Whole 30, I am more or less trying to follow the diet with one exception – I’m still eating beans and lentils. I felt like I ate so much meat last time, and beans didn’t seem to bother me too much (looking at you, dairy) so I decided to keep this vegetarian protein option in the mix. We’ll see how it goes. It should be noted, in the interest of honesty, that I kept off the weight I lost on the Whole 30 for six months. But then, I started drinking more often, and was eating way too much dairy and grain. Pretty soon, I realized I’d put back on the eight pounds I’d lost on Whole 30, plus a couple more, for a total of 12. After losing a total of 25 pounds last year, I’m amazed how fast I gained half of it back – it’s been three months. I’ve already lost two of it again just through exercise, but I’m hoping a major diet overhaul will get me back on the right track. Again. One can only eat so many bowls of lettuce before hitting up the Internet for something more interesting. Here are a couple recipes for vegetable side dishes I found that are keeping life interesting for me! 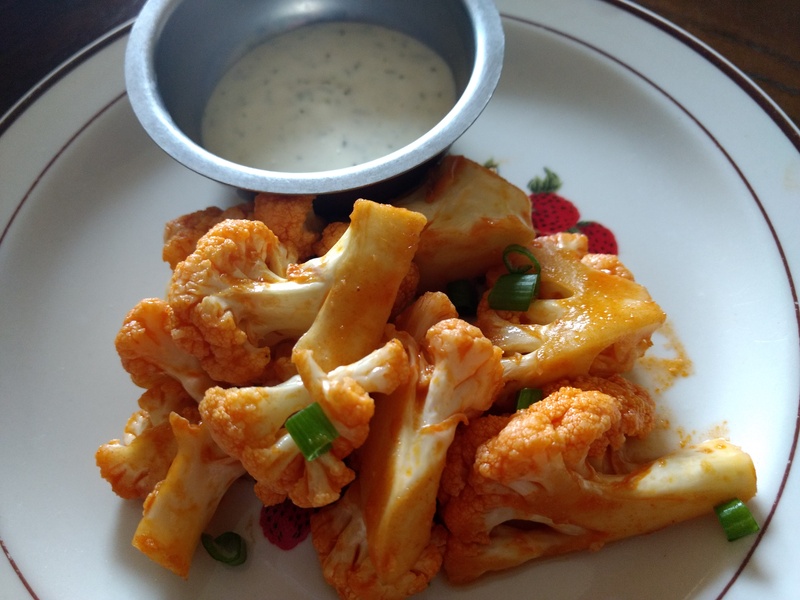 Buffalo cauliflower and homemade ranch. The Real Food Dietitians bring this recipe that’s actually really easy to do. Basically, you mix up a couple paleo-approved ingredients in a saucepan, then use part of the sauce to toss the cauliflower before you oven roast it. You toss the roasted cauliflower in the rest of it and you’re ready to go! Full recipe at the Real Food Dieticians. Bonus: I made their ranch dressing too, but I didn’t have all the ingredients so I faked it. I omitted the parsley and chives, and used about a teaspoon of minced fresh green onion instead. It’s delightful, if a little off from your usual ranch flavor. 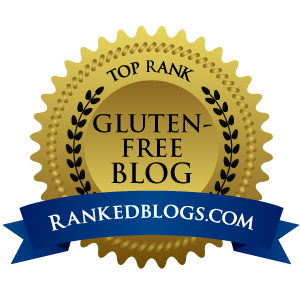 Note that I hated that Primal Kitchen Mayo they recommend, and I broke the rules by using a non-compliant mayo. I used Just Mayo, but Vegenaise (the soy free one) also works. They both have grainy things in them so if you’re strictly paleo/Whole 30, get the right stuff or make it yourself! It was even better on the second day! I started with this recipe from Genius Kitchen, but modified it so much I’m just going to write out what I did. I cut up a head of broccoli into florets, tossed it in a little olive oil, salt and pepper, and roasted it in the oven at 425F for 18-20 minutes. While that cooked, I diced up three slices of bacon and minced about a quarter of a yellow onion. I fried the bacon for a few minutes, then threw the onions in with it until the bacon was cooked but not crunchy, and the onions were just starting to caramelize. I only had raw cashews on hand, so I ran a knife through them a couple times to break them up, then toasted them in a dry pan with a little salt. For the dressing, I used about 1/2 cup of mayo, a tablespoon of apple cider vinegar, and the juice of half an orange. I whisked that up and added a little salt and pepper to it. 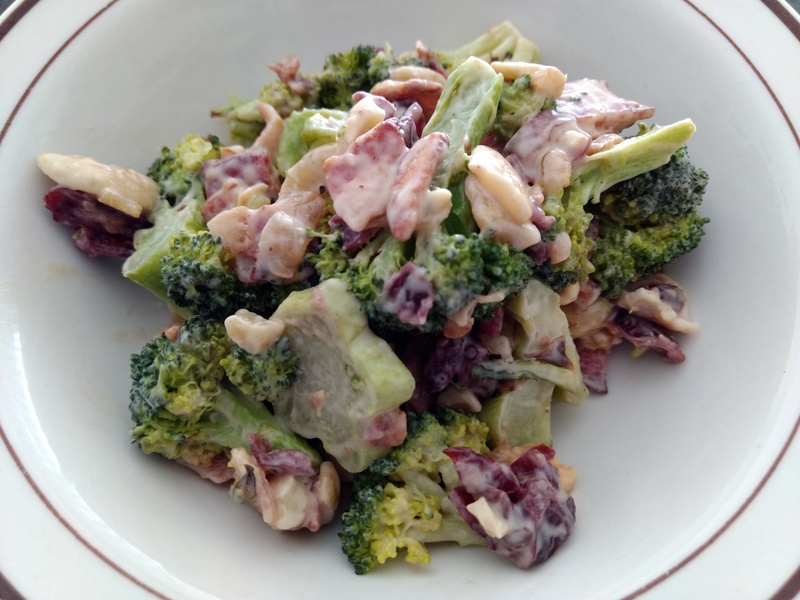 Another broccoli dish I really like is the Food Network’s Broccoli and Cashew Crunch – you’d have to omit or substitute the parmesan to make it paleo, but I’ve seen vegan parmesan recipes and they appear to be pine nut-based so it’s probably doable. Nutritional yeast might work too. Do you have any favorite Whole 30-compliant vegetable side dishes? Tell me in the comments!